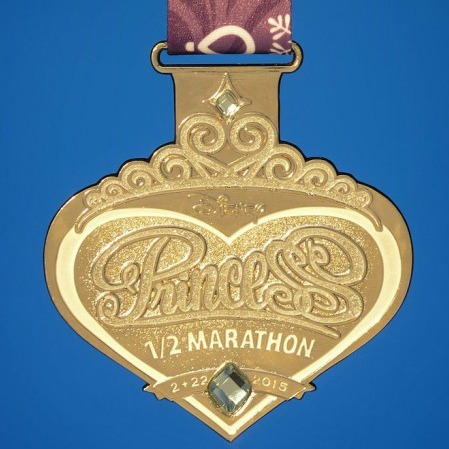 POSTED: Mon, 12/08/2014 - 06:00 | POSTED BY: Traci C.
runDisney has revealed the finisher medals for the 2015 Disney Princess Half Marathon Weekend presented by Children's Miracle Network Hospitals, and the medals feature design inspired by the film Frozen. The kids running the Disney Kids Races will receive a finisher medallion featuring everyone's favorite snowman, Olaf. And the Disney Frozen 5K finisher medallion features Anna and Elsa. Participants who finish the Princess Enchanted 10K will receive a finisher medal with a less obvious Frozen theme, a snowflake decorates the medal above the words "Princess 10K." The finisher medal for the Disney Princess Half Marathon still features the traditional princess tiara but the jewel that decorates the medal has an icy hue, reminiscent of Queen Elsa's dress. Runners who finish the Disney Glass Slipper Challenge will receive the Princess 10K medal, the Half Marathon medal, and the Glass Slipper Challenge medal. This last medal features Cinderella's glass slipper set atop a pillow. The medal also features an icy blue ring, giving a slight nod to Frozen. There are still a few Disney Princess Half Marathon registration spots available through groups and charities. Runners who are interested in participating can visit runDisney.com for more details.